Almost one half of the Afghan population (46%) lives below the poverty line. 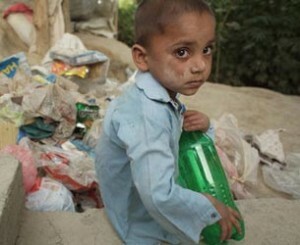 According to UN statistics, Afghanistan is the second poorest country in the world. The gross national income per citizen equals 370 dollars per year. By way of example, a judge or a teacher earns about 50 dollars per month. The child mortality rate is particularly high in Afghanistan and, according to international records, life expectancy at birth is considered to be the lowest. Statistics show that 35% of newborns are underweight. Even today, 87% of deliveries take place in the pregnant mother’s home and usually with no proper medical assistance. This is so because in the highly patriarchial Afghan society women do not often get permission to leave their home, even to go to the hospital. Therefore, 1 woman out of 8 dies during delivery. A very limited number of hospitals exist in Afghanistan. Sometimes, one would have to travel across hundreds of kilometers to reach one of these hospitals. Furthermore, the medical officers lack proper training and appropriate equipment. In addition, approximately 70% of the population does not have access to drinking water, which in turn results in a lot of health problems, especially among the younger children. Today, only around 60% of Afghan children are sent to school and only 28% of the adult population is literate. In addition, the education system is lacking infrastructure. In Kabul the number of students in some classes rises up to 60. Afghanistan also holds the saddening record of being the country which has the highest number of terrorist attacks aimed at schools, at girls schools in particular. Even though the abolition of the Taliban has made way for children to go back to school, progress has yet to be made when it comes to ensuring the security of students and guaranteeing the right to education of every Afghan child. In Afghanistan, around 20% of children are expected to work in order to provide for themselves and for their family. Street vendors, water carriers, cardboard collectors, shoe polishers, taxi solicitors, domestic servants, assistants in boutiques, are the kind of odd jobs done by Afghan children. The child plays an important economic role in the Afghan family structure, mainly because the little money earned by their parents is hardly enough to feed the hungry mouths in the family. Additionally, due to cultural practices, Afghan mothers rarely choose to seek employment outside their homes. In this situation, the family relies upon the economic contribution of the child, even if it means the child is left begging on the streets. Young Afghans are often made victims of violence. In 2009, around 250 children were killed during terrorist attacks. Moreover, many among them are victims of sexual abuse. About 1,500 incidents are recorded each year; unfortunately, the majority of the victims do not dare to reveal the unpleasant experiences they have gone through. Furthermore, most often the perpetrators are not taken to courts due to political reasons (former war lords or members of the government, corruption, etc). Only a serious change in attitude would save the Afghan children from being considered as objects prone to exploitation. Under the Taliban regime, thousands of Afghans under the age of 18 were enrolled in terrorist groups, in one way or another. They were first “brain washed”, then given training on the handling of weapons, and finally sent to war. Certain children, barely 6 years of age, were even used as child suicide bombers. In the beginning of 2011, Afghanistan signed an agreement with the United Nations to stop the recruitment of children into the national police; after it was included in the blacklist of the UNO since 2010. Thus the government takes the first step in an important process which could soon mark the end of the era of child soldiers and would help the already traumatized excombatants to reintegrate into civilian life. There are thousands of orphans in Afghanistan; this is, in fact, a direct consequence of the armed conflict which ravaged the country. Nevertheless, only a very few children are left to their own devices since the Afghan culture, mainly based on Muslim principles, makes it obligatory for Afghans to help children in need. Thus, orphans are generally taken in by members of the family or certain others in the village. Unfortunately, some “adoptive parents” treat these children as if they were little slaves. Sometimes the orphans are discriminated amidst the guardian’s own children and their education is given secondary attention. One can frequently observe a very strong desire towards employment by an orphaned child just in order to “pay back” his adoptive family as a mark of gratitude. It is necessary to create organizations which would allow the children access to education and which would also listen to them in an appropriate manner, providing proper care. A national plan for the protection of the child has already been launched to improve the situation. The presence of numerous land mines in Afghanistan still results in regular accidents, sometimes even fatal ones, especially among the very young who often fail to recognize such sites. 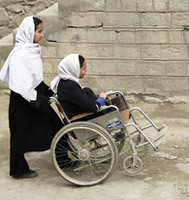 Many Afghan children are handicapped due to land mine explosions. Awareness campaigns and land mine clearance programs have been put in place by the government as well as by certain NGOs. Their objective is to free Afghan soil of landmines by the year 2013. Between 2000 and 2009, almost 40% of young women, when interviewed, confided that they were given in marriage before the age of 18. These early marriages could result in serious health problems among young women, especially when these young women are not yet ready to go through the experience of pregnancy. Only 6% of births are officially recorded in Afghanistan. 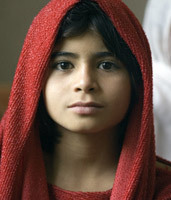 As a result the majority of Afghan children have neither an official identity nor a nationality. They are invisible in the eyes of society. This is particularly problematic for Afghan children who are refugees after having fled the war. 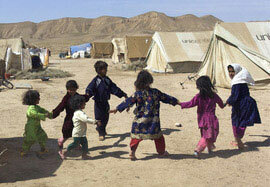 In refugee camps located in Pakistan or in Iran the number of child refugees can be up to 1.5 million. These children find their status illegal and thus they are not entitled to any sort of a civil right as a citizen in the country because they do not have an official legal existence. The Afghan criminal law does not differentiate between major crimes and minor offences. Despite the penal code for persons under the age of 18, adapted in the year 2005, in practice there is no alternative to prison for a child offender. This is in fact contrary to the article 40 of the International Convention of the Rights of the Child (CRC). Yet owing to the work done by numerous ONGs, progress can be observed in some regions. The legal system should, however, go through a general improvement in order to attain a state where child rights are considered more important than in the present situation.